Indira Model United Nations – iMUN 2015 is a 2 Day Conference held at Indira College of Commerce and Science Pune. The agenda involves debates, discussions and arguments based on a certain set of extremely sensitive issues across the globe. This year with four new Councils they are all set to welcome delegates from colleges all over the country on 23rd and 24th of December 2015. Scroll down to know more about the four major councils of iMUN 2015. What began as civil violence against President Bashar al-Assad’s regime in 2011 has escalated into a full-scale war with spillover into neighboring states. The conflict has drawn in external powers, including Gulf countries supporting the groups fighting against Assad, and Russia and Iran supporting the Syrian government. The United States has also joined the conflict as it has intensified. The Geneva II peace process, a UN-backed conference aimed at facilitating a political transition, has collapsed as opposition groups and the Syrian regime struggle to find acceptable terms for resolving the conflict. Since the start of the war 200,000 people have been killed and 7.6 million have been internally displaced. It is important to evaluate and assess the effect of war and mass casualty on the Syrian future generations. The state of refugees under foreign asylum and the involvement of humanitarian organizations in countering the aftereffects of war and the intervention of world leaders and foreign nations in the crisis is a topic of international debate and speculation requiring immediate provisions and stable measures. Agenda: Practicality of imposing sanctions in light of the Global Economic Crisis. Exploring the possibility of establishment of an independent and international reserve currency. Since 9/11, there has been a pronounced shift toward targeted or so-called “smart” sanctions, which aim to minimize the suffering of innocent civilians. Sanctions take a variety of forms, including travel bans, asset freezes, arms embargoes, capital restraints, foreign aid reductions, and trade restrictions. The Global Economic Crisis is spreading it’s roots in countries like Russia and Iran and it is observed that the civilians especially the middle class suffers from the drawbacks of economic sanctions which are meant to change the attitudes of the government towards maintaining foreign relations. Comprehensive economic sanctions, even qualified by “humanitarian exemptions”, do not make any practical sense for changing a recalcitrant State’s policies. The traditional theory behind sanctions is disproved by evidence from recent sanctions regimes. The reserve currency is commonly used in international transactions and often considered a hard currency or safe-haven currency. International currencies in the past have included the Greek drachma, coined in the fifth century B.C., the Roman denari, the Byzantine solidus and Islamic dinar of the middle-ages, the Venetian ducato of the Renaissance, the seventeenth century Dutch guilder and, more recently, the British pound and U.S. dollar. China, Russia, India, Turkey, Brazil, Venezuela and oil-producing countries have recently agreed “to transact all of their mutual trade and investment in their own currencies” effectively minimizing the need, at least in the short term, for a global reserve currency. This has led to the decline in the status of U.S. dollar and Euro as the world’s go-to reserve currencies for international trade and the possibility of rise of alternative reserve currencies has been widely speculated in view of stabilizing the global economic system. Agenda: Strengthening mechanisms to prevent drug laundering which relates to terrorism funding. Success in the global fight against trafficking in drugs, as well as the associated problems of transnational organized crime and money-laundering, requires interlocking national, regional and international strategies rooted in global cooperation. The Western hemisphere and Europe constitute major markets for illegal drugs which are the key source of funding for criminal and terrorist groups and the after effects can be witnessed in downtrodden terrains of East Asia and Africa marred by political and economic instability. To entertain measures in targeting drug trafficking and reducing corruption in favor of human rights it is extremely important to target both international and domestic drug markets and create dialogue between nations. Agenda: Protection of world heritage sites in conflict zones with special emphasis on the Middle East. World heritage sites around the globe are continually threatened by the various conflicts arising out of human disputes and acts of terrorism. A number of ancient monuments and heralds have been destroyed in countries under war such as in Northern Iraq and Syria. The UNESCO world heritage convention aims to unite nations in turning tables on blatant disregard for cultural heritage and to employ measures to spread awareness and prevent the upheaval of such property of historical significance for not just the country but to the whole world. Various bodies and conventions under UNESCO are constantly in works to identify heritage sites and to implement these measures with assistance from other international counterparts. Many times this destruction of historical property is related to cultural genocide and hence there are provisions relating to funding of measures against attacks over these properties. One of the founding members of Campus Times Pune. Passionate about photography. A big fan of stand up comedy and anything that doesn't involve Sajid Khan or Honey Singh. He has a new found love for cutting chai and also some John Mayer music. In his free time, he likes to goof around with a little bit of web designing and watch Arnub Goswami debate with himself. BMCC Troika 2016 Selfie Booth Pictures By Campus Times Pune Are Out! Honest College Review : 13 Things to Know About PCCOE Before Taking Admission for Engineering! A List Of Do’s and Don’ts on Holi-day! 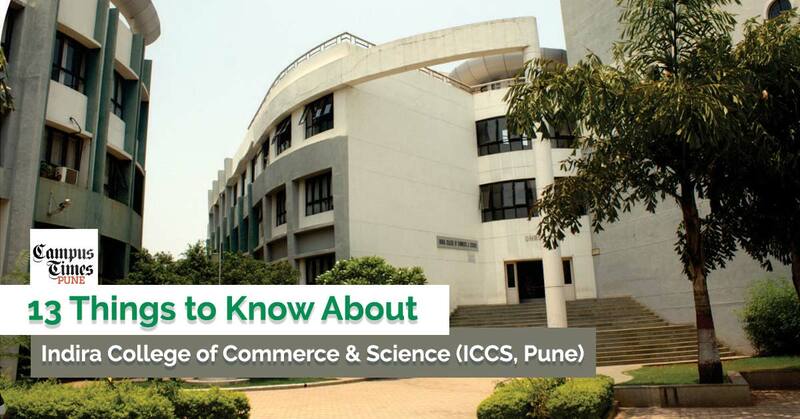 Presenting the Honest College Review of Indira College of Commerce and Science (ICCS Pune). Know some unknown facts about Indira College.